As the year is coming to an end, I wanted to close out the year with a few movies that went under the radar this year. These movies may have not made everyone’s year-end list, and some people may have not seen or heard of them, so I wanted to compile a list for anyone looking to watch something different. A few of these films did not make their budget back at the box office, and some didn’t get fair critical recognition due to their limited theatrical releases. Haven’t had a chance to review all of them for the site, so I’ll include a short write-up for the ones that don’t have a full review. Same rating scale applies from Best to Worst: Fresh Horchata, Fuego, Bueno, a si a si, Basura, All Mames Wey. Fake news, alternative facts, government mandates, lying leaders, isn’t just America in 2018, but it’s also a country that is ever so divided in a dystopian future in The Oath. Starring, written and directed by Ike Barinholtz (MADtv, Blockers) the film is a dark comedy that explores the drama when a family with opposing political views has to live under one roof during the week of Thanksgiving. Tiffany Haddish was actually directed in this film and it’s her best performance of 2018. The Oath has its flaws, but, overall, it’s a fun comedy to watch with your friends and family. 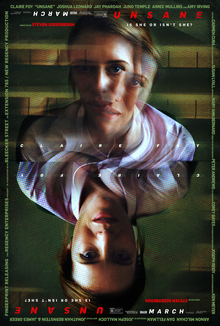 Unsane is notable because the entire film was shot using an iPhone 7 Plus. This decision allows the movie to be more creative in its storytelling. Claire Foy does an incredible job as Sawyer, a young lady who thinks her stalker is trapped in the mental hospital with her, and the filmmaking is effective enough where you question if she’s insane or not. For fans of psychological-horror I would strongly recommend checking this one out. Thoroughbreds was written and directed by Cory Finley, and stars Olivia Cooke, the late Anton Yelchin, and scream queen Anya Taylor-Joy. Cooke does a spectacular job at portraying the emotionless Amanda, and Taylor-Joy’s performance as the naive Lily makes this one of the most entertaining films of 2018. The film finds the right balance between humor and thrilling as the two girls figure out a plot to murder Cooke’s father. Yelchin’s character as a drug dealer is far cry from his role on the hit tv show Glee, and unfortunately, he passed away before we had a chance to see his true range. This underrated film did not get a lot of promotion upon its release back in March, and its a true diamond in the rough that more people would enjoy if they knew about it. This crime drama is based on a true story of a library heist gone awry and, was one of the funniest movies of the year. Starring Evan Peters, Barry Keoghan, Jared Abrahamson and Blake Jenner, American Animals, follows four college students as they devise a plan to steal a highly collectible rare book from their college library. This a perfect film for anyone who is thinking about the societal pressures that life in America brings when it comes to finding success amongst your peers, The way the narrative is told is from the actual students, who the film is based on, as they tell the story from what they remember happening leading up to the day of the heist. It’s creative and the cast gels together perfectly and Layton’s direction accounts for some unique shots throughout the film. Directed by Leigh Whannell, one half of the duo that created the Saw franchise, Upgrade is a joyride filled with action and some hints of horror. This film is everything that Venom should-be, to the point that Upgrade star Logan Marshall-Green even looks like Tom Hardy. There’s a plethora of dark humor scattered throughout the movie and the action scenes are vicious, yet they’ll leave you with the stankface, after the gruesome demise of a few of the antagonists. There’s a cool twist in the movie that I do not want to spoil, so favorite this review and watch it. Based on the 2017 novel of the same name, A Simple Favor, stars Anna Kendrick and Blake Lively and is directed by Paul Fieg. Kendrick plays a mommy vlogger who tries to solve the mystery of the disappearance of her best friend, played by Lively. This movie was hilarious, filled with twist, and has subtle clues that you have to pay close attention to, to solve the mystery at the end. The chemistry of Kendrick and Lively is up there with some of the best pairings of 2018. Like the movie title says, do yourself A Simple Favor, and check this one out. Full review here. |Eva Vives’s directorial debut All About Nina has a lot to say and is an important movie in today’s climate. Vives started writing the script around 3 years ago, and the film is a semi-biographical account of her life. 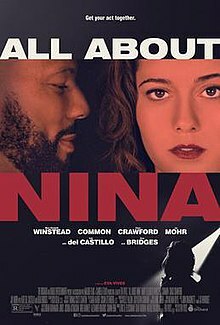 All About Nina has emotional appeal, and in today’s #MeToo climate, it helps us understand that you never know what someone is going through, no matter how strong they seem when they’re on stage. Mary Elizabeth Winstead has another excellent performance as Nina Gelds. If you’re looking for something unique, funny yet sad, then get your act together and give it a viewing. Full review here. |Bad Times at the El Royale was a lot of things, humorous, serious, well-acted, well-directed and visually sharp as getting glass stuck in your head. The director and cast brought their A-game to a film that was written and directed by Drew Goddard, and starring Jeff Bridges, John Hamm, Cynthia Erivo, Chris Hemsworth, Dakota Johnson and Cailee Spaeny, with newcomer Lewis Pullman. Produced by 20th Century Fox, who let Goddard take risks and be creative if he and the cast took a pay cut,.The performances are beyond stellar and Goddard does such a great job getting the most out of every single performance. If you’re a fan of any of the actors, actresses or director/writer Drew Goddard’s previous work, then I would recommend giving this one a viewing. Full Review here. |The biopic Can You Ever Forgive Me? starring Melissa McCarthy and Richard E. Grant is based on the Lee Israel memoir of the same name. Marrielle Heller’s direction brings out the best of McCarthy. McCarthy and Grant’s chemistry with each other is addicting to watch. Their back and forth banter feels organic, and whenever they’re on screen with each other it’s amusing, charming and never feels forced. Grant has more of a dry humor, and McCarthy’s usual shtick is nowhere to be seen, and it greatly benefits the film. 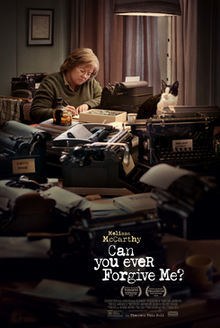 A biopic about an author turned literary letter-forger doesn’t sound as glamorous as the life of a rockstar, or as breathtaking as the life of the first man on the moon, but Heller, McCarthy and Grant turned it into one of this year’s most interesting stories to forge its way onto the silver screen. Full review here. |The A24 produced throwback film is the directorial debut, written by Jonah Hill. The film is a coming-of-age drama with a number of fresh faces. Casting includes actors such as Sunny Suljic, Lucas Hedges, Katherine Waterston, and skateboarders Na-Kel Smith, Ryder McLaughlin, Olan Prenatt, and Gio Galicia. Outside of the retro setting and the 90s clothing, the film’s 4:3 aspect ratio was a perfect choice that adds to the nostalgic viewing experience. Watching the film, its aesthetic made me yearn for the days of VHS before everything was HD or 4K and perfectly fitted to the screen. Something so small adds to the film’s authenticity. The soundtrack of the film was composed of 1990s music and the score fits the tone perfectly. Hill uses a lot of close shots and reaction shots to get a wide range of emotions from the characters’ faces. One of the smartest things Jonah did when making this film was casting skaters whose personalities would translate well to the screen versus casting actors and teaching them how to skate. All the skaters come off as faithful and honest without feeling Hollywood or overproduced. For all the 90s kids, looking for a throwback to simpler times, then mid90s is a movie made for you. Folks, we have finally reached the end of this list and the most underappreciated film of 2018 is. . . . . . . . . . . . . . . . .
Full review here.| First, this movie deserves more than to be forgotten on YouTube Premium or whatever YouTube is calling their streaming service (if they still have one) by the time you’re reading this. 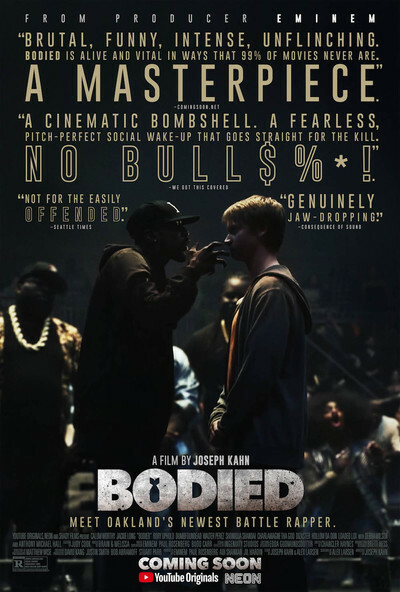 A thesis on the poetic function of the ‘n-word’ in battle rap is the catalyst for Bodied, a satirical drama-comedy into the world of battle rap. The technical aspects of the movie are some of the best of the year. Director Joseph Kahn’s visual direction makes this film fun to watch because everything is shot slick and in a creative way that comes from his background in music video direction. From close-ups on characters facing transitions and different angles, Kahn’s visual direction gives the film a true art experience. The actors who are battling do their best to make their battles feel authentic. The battle rappers who are acting get to showcase some of their personalities that aren’t normally seen in their battles. The film examines the way we view the context of Freedom of Speech using battle rap in an intriguing way. If I had to breakdown the films acts for battleheads, this film is a 2-1, but for the average fan this might be a 3-0…body. If you want to watch Bodied it is currently available for stream on YouTube Premium. Thanks for checking out my list of the Most Underappreciated Movies of 2018. Stay tuned for my list of the Top 10 Films of 2018 and The Most Anticipated Films of 2019. Follow the blog on Twitter and LetterBoxd @PeliculasCosas and on Instagram @PeliculasAndCosas. Have a Happy New Year and we’ll catch you next time!